According to the American Heart Association, more than 73 million Americans are affected by high blood pressure. High blood pressure, also referred to as hypertension, cause the heart to work harder to overcome increased pressure in the arteries. If left untreated, high blood pressure can cause damage to the muscle of the heart and weaken artery walls. 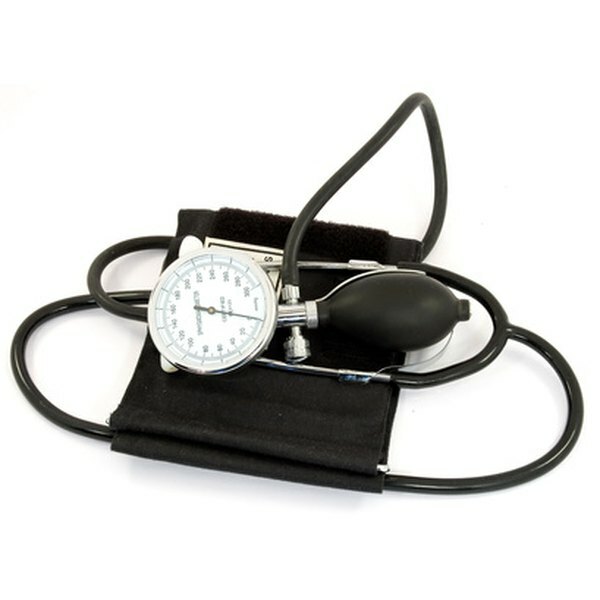 Blood pressure can be routinely monitored by using a sphygmomanometer. A sphymomanometer uses a gauge containing mercury to measure pressure. It is important to calibrate your sphygmomanometer at least every 12 months to ensure its readings are accurate. Check over the parts of the sphygmomanometer to ensure they are functioning properly. Inspect the tubing for any leaks or damage. Twist the thumb valve and look for any abnormal movement. Look for smooth gauge movement. If any of these parts are not working properly, your calibration results will be incorrect. Use one hand to grasp the rubber tubing near the hand bulb. Use the other hand to grasp the bulb. Twist and pull to remove the hand bulb from the end of the tubing. Insert the Y-connector into the end of the tubing. Insert the end of the manometer into one end of the tubing. The manometer is a simple pressure gauge that will read the "true" pressure. Insert the Y-connector into the other end of the tube. Insert the bulb into the other end of the Y-connector. Open the thumb valve by twisting it all the way to the left. Ensure the cuff is completely deflated. Look at the gauges of the sphygmomanometer and the manometer. They should both read 0 mmHg. Record any discrepancies. Close the thumb valve and increase the sphygmomanometer pressure to 200 mmHg. Check the gauge of the reference manometer against the reading of the sphygmomanometer. Record any discrepencies. Twist the thumb valve to the left slowly, and begin deflating the cuff at approximately 2 mmHg per second. Watch the movement of the gauge. Close the valve when the reference manometer reads 100 mmHg. Check the gauge of the sphygmomanometer and record if there is any change. Look at the numbers you have recorded. If there is any discrepancy over 2 mmHg, the sphygmomanometer requires service.